Strike gold with our California Meatless Burger. Cucumbers, colorful peppers, avocados and a whole wheat bun make this a meatless burger to remember. Cook burger as directed on package. Fill bun with lettuce, burger and remaining ingredients. 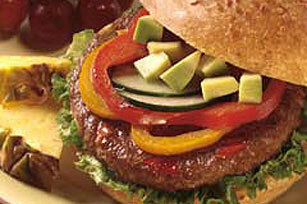 Prepare using a BOCA Meatless Grilled Vegetable Burger. Save time by microwaving the burger as directed on package. Mash remaining avocado with 1/4 cup TACO BELL® Thick & Chunky Salsa for a quick-and-easy guacamole.